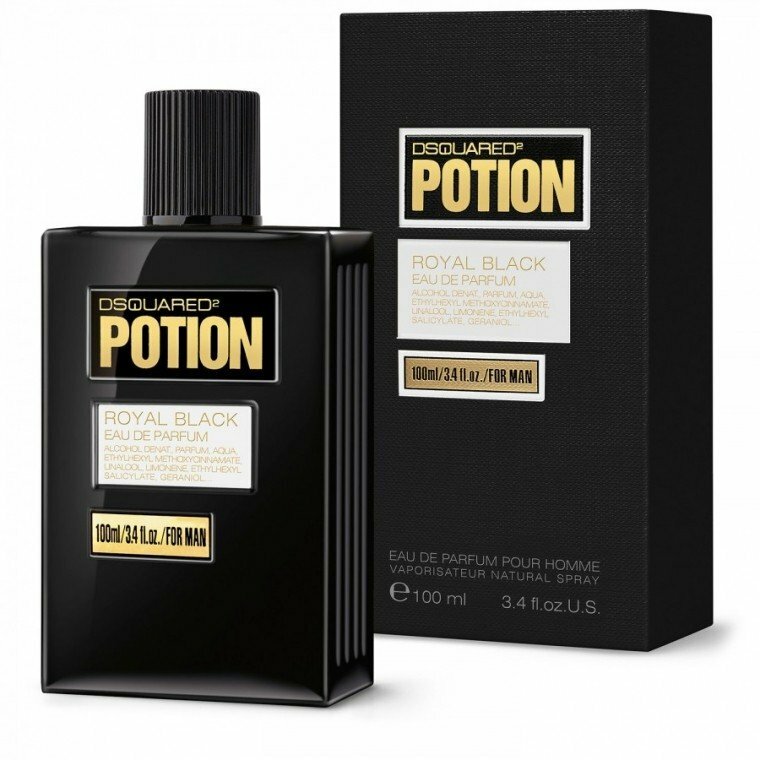 Potion Royal Black is a popular perfume by Dsquared² for men and was released in 2013. The scent is woody-spicy. The longevity is above-average. It was last marketed by ITF Cosmetics. I could pick up the rose and the incense even before I pulled the bottle out of the pack. This thing explodes in your face as soon as you hit the trigger. It is thick, dark, syrupy and intense. It's heavily spicy and resinous. After about 15 mins or so it tones down a bit to reveal it's structure. A hint of citrus at the top, almost slightly bitter-ish - probably due to the pimento. I get quite a few spicy nuances - nutmeg, hints of cinnamon and a boat-load of pepper. The heart notes reveal themselves pretty much at the beginning itself. A thick, not too sweet, syrupy rose and divine frankincense. Smelling very heady and smoky. Blending really well with all the spices and a brilliantly realistic dry, non-sweet, tobacco accord. This is definitely the best stage of this fragrance. And it lasts a really long time. There's a decent, but very generic, oud-leather accord here too quite reminiscent of Montale's Aoud Leather and Dueto's Golden Boy. The drydown, which arrives some 8-10 hours later, is slightly musky with hints of powdery rose and a dusty-woody accord. This stage too lasts a long time. Another 6-8 hours easily. Projection, sillage and longevity are on the higher side. Really solid. Go easy on the trigger. It easily lasts 24 hours on my skin and for many days on my clothes. Overall this is really well made. If not for the generic oud-leather accord and seemingly simple drydown this would have been great. Not groundbreaking but definitely good to wear (only in cold weather). Try it if you are looking for a dark smoky-spicy rose scent. Potion Royal Black opens with an extremely brief whiff of restrained bergamot citrus before transitioning to its early heart. As the composition enters its heart, the citrus disappears, giving way to a heavy barrage of black pepper spice and cashmeran-derived soft blonde woods that take the fore. Underpinning the staring spiced soft woods lies a prominent waxy accord - most likely iris based, further supported by just detectable dark dull rose and earthy dry realistic tobacco leaf from the base peeping through. During the late dry-down the cashmeran completely takes over as the florals and spice gradually recede, dominating everything in its path and remaining through the finish with trace leavings of the dry tobacco left in support. Projection is slightly above average and longevity excellent to outstanding at well over 12 hours on skin. Potion Royal Black immediately catches the eye with its gorgeous solid black bottle in the same apothecary style of the original. With bottle looks like that, one really wants to love its contents but very early-on Royal Black's liberal use of the synthetic soft blonde woods emulator cashmeran kills any chance. If the synthetic soft woods were not enough to dissuade one's enjoyment of the composition, its waxy iris underlying mix seals the deal. There are some very passing similarities to Declaration by Cartier in this particular aspect of the composition's development but the two are quite different on the whole. What some feared but this reviewer actually hoped for was the possibility of a much more prominent rose floral aspect to the composition, but alas the rose is just barely noticeable in the heart and what is there is a very stark dulled rose that really doesn't add much to the mix. On the plus side, the dry tobacco used is extremely realistic, resembling the stuff used in Bright Leaf by Murdock but without any sweetness. The tobacco definitely is the bright spot of the development but like everything else it gets swallowed by the tenacious synthetic soft blonde woods that smother everything in their path. One final closing point to make is Potion Royal Black apart from the same bottle style has absolutely no relation to the original Potion and one should not use it as a yardstick for whether they will enjoy the original. The bottom line is Potion Royal Black with its gorgeous bottle and $55 per 100ml bottle street price is an enticing option, but its heavy-handed use of cashmeran is a composition killer, earning it a "below average" 2 to 2.5 stars out of 5 rating and a mild avoid unless you enjoy that particular ingredient. 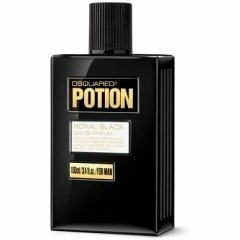 Write the first Review for Potion Royal Black!